I’m sure you’ve seen these Sanrio bentos circulating online. 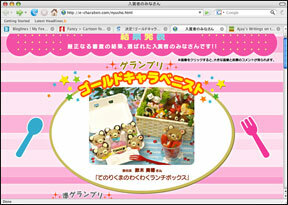 It appears that those Hello Kitty Kyara Ben are actually part of the Sanrio Kyara-ben Grand Prix 2007. Well, if you enjoyed admiring those bento, you’ll be glad to learn that there’s also a Grand Prix for 2008. Wander over to this link and enjoy this new batch of adorably cute Sanrio lunches. Before you guys go off to be dazzled by the cuteness though, I just want to pass the word about Lasang Pinoy 25. Lasang Pinoy is a monthly food blogging event that features Filipino cuisine. This month goes fusion as Japanese bento aesthetics go Pinoy. The theme? Make your Own Bento! The details and actual announcement are on the Lasang Pinoy site. Deadline is on April 30 with a round up on May 7. If you have any questions, please contact this round’s host, Ajay’s Writings on the Wallâ€¦. This entry was posted in link love. Bookmark the permalink.